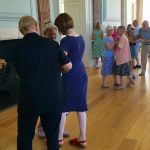 More than twenty guests enjoyed the monthly session of Tea and Dance Lessons in the Court House ballroom on July 10th. 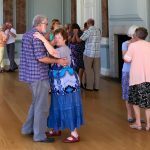 With the sun streaming in through the windows they moved elegantly round the floor, starting with a social foxtrot followed by a waltz, under the guidance of Chris and Barbara from Majestic Dance. 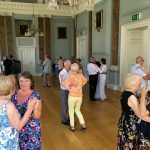 The Tea and Dance Lessons take place in the restored Regency ballroom on the first floor of the Jury Street Court House. There’s no need to book. Just turn up. In the interval there was time to chat over tea, coffee, fruit juice and cake served by Cllr Dorothy Da Cruz and Unlocking Warwick’s Sue Rigby. These social occasions happen between 2pm and 4pm on the second Tuesday of each month. 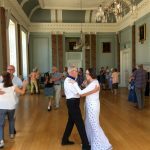 There’s no need to book, and you don’t need to have any experience of ballroom dancing. Chris will show you the steps. 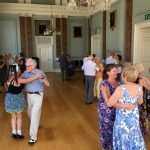 The ballroom , restored and reopened in 2014, is a perfect venue. 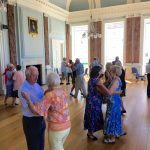 So why not come along to the next Tea and Dance Lessons at the Jury Street Court House on August 14th.